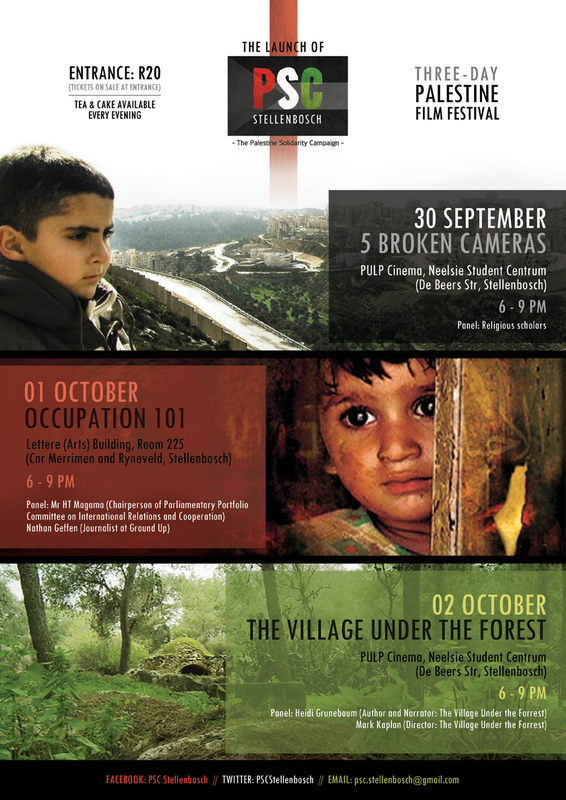 Join PSC Stellenbosch for three great movies on Palestine-Israel followed by a short discussion after each screening. Tea and cake will be served at 18:00 and the screenings start at 18:30. Tickets @ R20 will be sold at the entrance. We as the Palestine Solidarity Campaign (PSC) Stellenbosch invite you and your friends and colleagues to all three screenings as we want to raise for public debate Israel’s occupation of the Palestinian Territories, its impact on the brutalisation of both Israelis and Palestinians, and Israel’s breaching of international law. Monday: Father Austin Jackson and a Muslim scholar. Facilitator: Adli Peck. Tuesday: the Honourable Mr HT Magama (Chair of the Parliamentary Portfolio Committee on International Relations and Cooperation), Mr Nathan Geffen (past-Treasurer of the Treatment Action Campaign and now an investigative journalist at Groundup). Facilitator: Dr Paul Hendler. Wednesday: Mark Kaplan (Director of the film) and Heidi Grunebaum (author, screen writer and narrator in the film). Facilitator: Rev Edwin Arrison, Kairos Southern Africa. PSC Stellenbosch does not take sides between countries, ethnic groups, and religions, and we stand for equality between genders and sexual preference groups – we are unequivocally against the oppression of a people and the violation of the international human rights laws. In this context we advocate for the ending of Israel’s occupation of Palestine, for a just peace and thereby for the dignity and freedom of all the people in Israel and the Occupied Palestinian Territories. The Occupation is often portrayed as a complex conflict between equal parties – the Palestinians on the one side and the Israelis on the other. The mainstream media sometimes presents the conflict as having a religious dimension and this contributes to its seeming intractability. Perhaps you have the impression that the situation is too complicated for the conflict to be solved? PSC Stellenbosch adopts an International Law and Human Rights perspective because there are clear guidelines under International Law, which help to clear the waters that have been muddied in this ‘debate’. We think that by having people look at all three films we are facilitating an awareness about the nature of the occupation as well as its status under international law. International law regards the Occupied Palestinian Territories (OPT) under ‘belligerent occupation’, which is intended to be temporary. However Israel has occupied the West Bank for 46 years and Gaza is still under siege. The International Convention on the Elimination of All Forms of Racial Discrimination (ICERD) (1965) provides the basis for, and the International Convention for the Suppression and Punishment of the Crime of Apartheid (‘Apartheid Convention’) (1973) as well as the Rome Statute of the International Criminal Court (‘Rome Statute’) (1998) define, apartheid as an international crime, not as it was practiced in South Africa, but as a system that: 1) denies people’s right to life and liberty; 2) imposes conditions to cause the physical destruction of a racial group; 3) implements measures to prevent a racial group from participating in the political/social/economic/cultural life of society; 4) divides the population along racial lines; 5) exploits the labour of a particular racial group; and, 6) persecutes organisations and people opposing apartheid. A 302 page HSRC (www.hsrc.ac.za) study of Israel’s policies found that Israel practices apartheid in the OPT through: a) Extra-judicial killings, torture and a separate legal system; b) Restrictions on the right of full development of Palestinians as a group such as those on their freedom of movement, place of residence, nationality, work, etc. ); c) Impeding Palestinians’ education and running a segregated education system; and restricting Palestinians freedom of expression and opinion as well as their freedom of peaceful assembly; and, d) Dividing the West Bank into racial cantons, extensive appropriation of Palestinian land for exclusive Jewish use, arresting, imprisoning, and banning the travel of Palestinians and also targeting Palestinian parliamentarians, national political leaders and human rights defenders. What a shame – you appear to be connected to the SACC (SA Council of Churches). Again, SHAME ON YOU, MARTHIE!